Valencia: Have you seen the new, orange Mestalla? Finally we can show you how much the stadium of Valencia CF changed since the replacement of old seats began in August. Now it's much more in tune with the club's image and surely more dramatic. Is it better too? 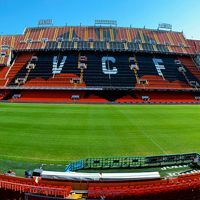 The plans were announced in July, when Valencia CF announced the plan to improve club image with complete seat replacement. The operation was to see Estadio Mestalla change colours inside from fading blue to orange, including the symbol of bat from the side's crest. The new 55,000 seats were ordered in three main colours: orange, the dominant one, black (for a massive 90-meter wide bat symbol at the east side and phrase Amunt Valencia on both ends) and white. The latter creates an interesting gradient behind goals together with orange seats: the further up you look, the lighter the shade of orange gets.